Meet Fritz, a Tucson Dachshund that won the local qualifying race for Wienerschnitzel's 2011 Annual Wiener National Finals back in March. Right now (!!!) 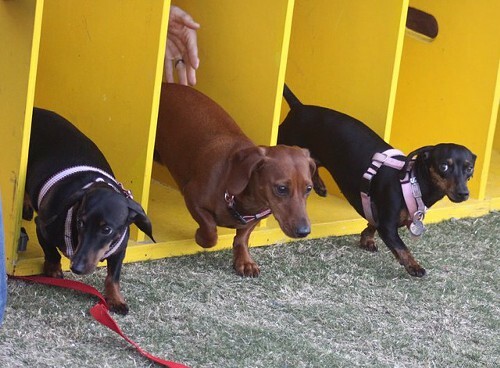 in San Diego, Fritz is running his tiny little dog heart out to try to win the quite prestigious title, $1,000 and the opportunity to ride on Wienerschnitzel's float in the Big Bay Balloon Parade. There are other dogs in the race from towns in California, Texas and New Mexico, but as Arizona's only representative, this is surely an opportunity for our state to repair its damaged national reputation with a victory in this hotly-contested race. Good luck, Fritz. Arizona is counting on you.